The University of California in San Diego (UCSD) organized a two day event in order to pioneer the emerging field of Software Studies. 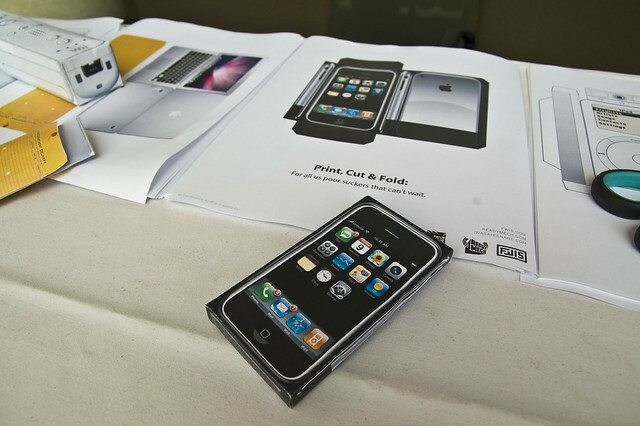 The first day was a public event titled SoftWhere 2008 which consisted of over fifteen short presentation in Pecha Kucha style. The second day consisted of a closed strategic session that dealt with more formal questions on the shaping of a new field of studies and will be discussed in a follow-up blog post. The title of the workshop ‘SoftWhere’ embodies the question of demarcating an area of study. Our current society is penetrated by and shaped by software and should thus be subject to appropriate critique. The ubiquity of software has led to a software culture and we are now living in a software society. What does it mean to live in such a software society instead of an industrial society? A world which is created by software is opaque and that is why we need to study software. We should question the streams behind, embedded in and woven through our society and look at what is happening behind the screens. SoftWhere? SoftEverywhere! 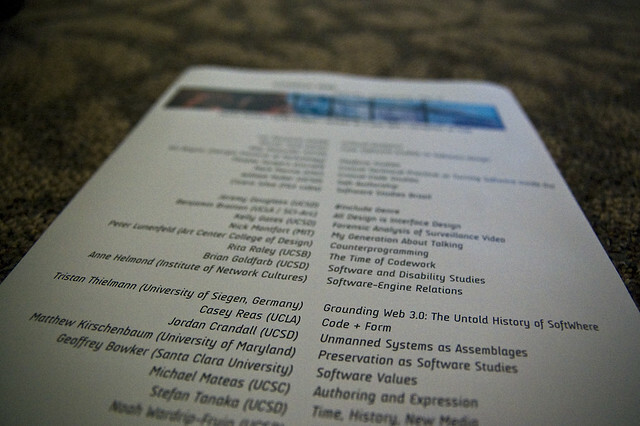 The Software Studies workshop was organized by UCSD and most of the participants were either from the University of California in San Diego or Irvine or Los Angeles. Participants were asked to prepare a short presentation preferably in Pecha Kucha style. 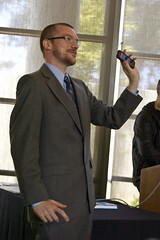 Jeremy Douglass, the first Software Studies Initiative postdoc, was strictly timing our presentations as each of us had either exactly seven minutes or if you followed the Pecha Kucha style of 20 seconds for 20 slides six minutes and fourty seconds. It turned out to be a great format to listen to almost twenty presentations in just one afternoon. Douglass was a great timekeeper, or rather his iPhone stopwatch that made an alarming sound after seven minutes forcing some speakers to cut their story short. In Jeremy’s own apologetic words: “It’s not me, it’s the software.” The presentations showed the diverse perspectives on software and software culture. The diversity of approaches and topics in the research may serve as an intellectual map of the people present. 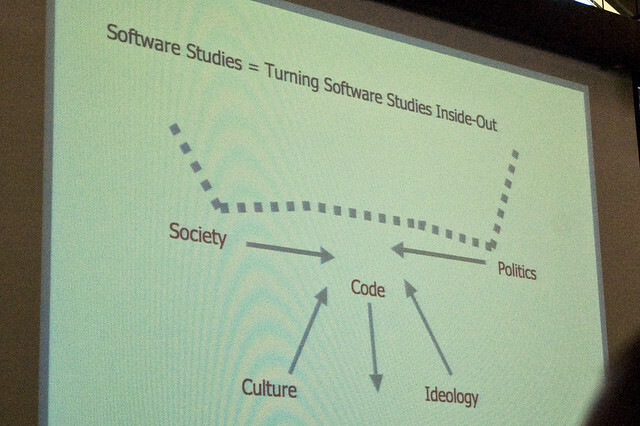 They may also serve to determine a common ground in the extremely diverse approaches to software studies. Liz Losh from Virtualpolitik wrote an extensive post on the “speed dating” Pecha Kucha presentations. What Kirschenbaum is referring to with critical storage studies is the fact that without preservation there is no field. If we want to establish and maintain a new field of Software Studies we should also look at the preservation of software. Emulators are only one way of thinking about storage and keeping software ‘alive’ because we are dealing with a hybrid cultural heritage. This is illustrated ‘the Preserving Virtual Worlds Project‘ that Kirschenbaum is currently working on. What are we looking at if we study software? Which layers do we need to address and which questions and fields have previously addressed similar issues? These questions were part of the second day of the Software Studies workshop which dealt with the typical What, Where, When and How questions and will be addressed in a next post. This is the first post in a series on the Software Studies Workshop at UCSD and the Software Studies Panel at the HASTAC II Conference at UCI and UCLA. Please subscribe to my RSS feed to keep up with updates. This post was originally written for the Institute of Network Cultures who made it possible for me to attend the workshop in San Diego, CA, USA.